Mundra International Container Terminal is blessed with multimodal connectivity only few terminals can boast of. 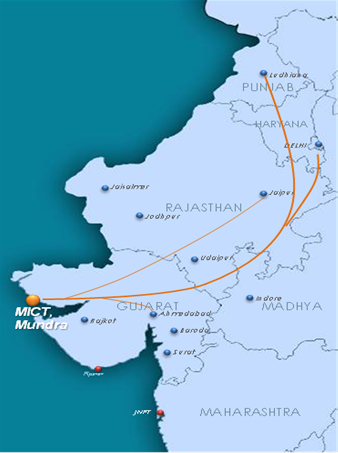 MICT is well connected by road and rail links to all the major cargo centers in the North West hinterland and thereby with the rest of India. The port is already connected by a 2-lane road to the National Highway and is improving the road connectivity to the hinterland. MICT has an on dock rail yard and rail loading facility and has the advantage of being the nearest port to the Northern region which is India’s fastest growing region with respect to container traffic. All the major ICD’s in the region have already declared their tariffs.